The Blue Line in downtown Los Angeles. Photo by Fred Camino. In July of this summer, the Blue Line will turn 20 years old. The last streetcars rolled through Los Angeles in the early 1960s; it wasn’t until the Blue Line’s debut in 1990 that mass transit rail service returned to the region. In January, the Blue Line saw nearly 78,000 boardings on the average weekday. Of the three light rail lines that Metro operates, it is the most heavily ridden and is, in fact, one of the busier light rail lines in the United States. On most days in the past 20 years, Blue Line service has gone off without a hitch. Unfortunately, there have also been some very difficult days when it has not. In the past two decades, 26 motorists have been killed in collisions with the Blue Line and 51 pedestrians have also been struck and killed by the train. Another 22 died — including 14 in the past decade — in incidents ruled suicides by the Los Angeles County Coroner. In the worst accident, a gypsy cab driven by a drunk tried to outrun a Blue Line train and made an illegal left turn around a lowered crossing gate and was struck in 1999, killing six people who were in the taxi. All told, there have been 99 fatalities involving the Blue Line. In addition, there have been 842 accidents involving the train — many relatively minor — from July 1990 through June 2009, according to data gathered by Metro’s Corporate Safety Department. Of those, 666 involved collisions between a train and a vehicle and 176 involved pedestrians being hit by a train. Complete data on who was to blame in all these accidents was unavailable; Metro safety officials say that they are unaware of train operators being at fault in an accident since outward-looking video cameras were placed on the Blue Line in 2006. Over the next several days, we are going to publish a series of posts on The Source about the Blue Line. The intention is to provide the public some of the considerable data that Metro has gathered about the accidents, to explain some of the safety issues involved and to implore riders, motorists and pedestrians to be safe around the train, tracks and stations. The idea is not to preempt media coverage or any analysis of the Blue Line by those outside of Metro. Outside scrutiny is welcome, appropriate and inevitable — Metro, after all, is a public agency. Rather, we hope to use the Internet to provide key data and offer some context about the Blue Line from the agency’s point of view. Metro takes a “3 E’s” approach to the Blue Line — focusing on engineering, enforcement and education. We will try to explain each of those in separate posts. A few Blue Line facts. Although much of the train’s journey in Los Angeles and Long Beach is along streets, there is also a considerable stretch where the Blue Line runs adjacent to freight train tracks and where the train can reach speeds of 55 mph. There are 103 grade crossings of Blue Line tracks — ranging from big streets to driveways — 27 of which have crossing gates. Along the street running portion of the line, the Blue Line travels at posted traffic speeds and operators have their own set of special train signals. In order to avoid confusion, these signals are intentionally not installed in close proximity to traffic signals visible to motorists. In this type of alignment, also known as street-running, there are no crossing gates — an arrangement typical of street-running light rail lines in cities across the United States. •The overall rate of accidents — based on five-year averages — has declined from 4.09 per 100,000 train miles in the first five years of the Blue Line’s operation to 1.09 in the past five years. The chart below offers a different take, showing that the number of accidents by month and year over the past decade has generally been decreasing. 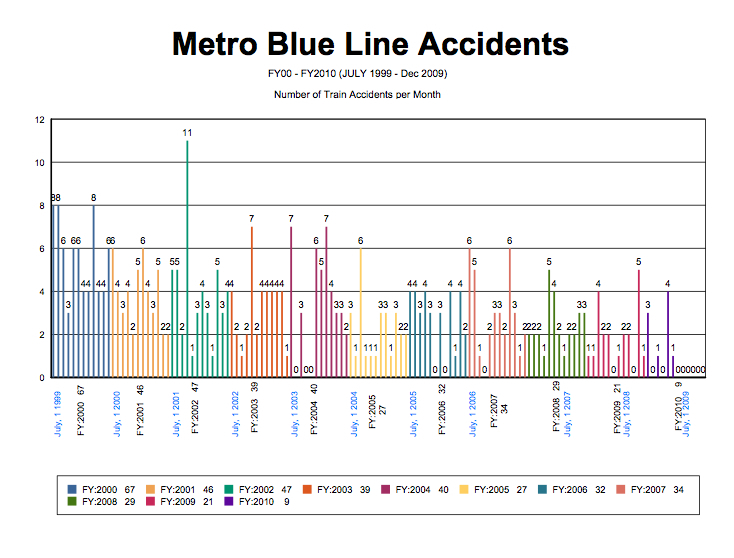 Blue Line accidents over the past decade. Click above for a larger image. •The number of train-vehicle accidents has also declined and the number of fatalities from those type of accidents has fallen from 21 in the 1990s to five in the 2000s. See the chart below. 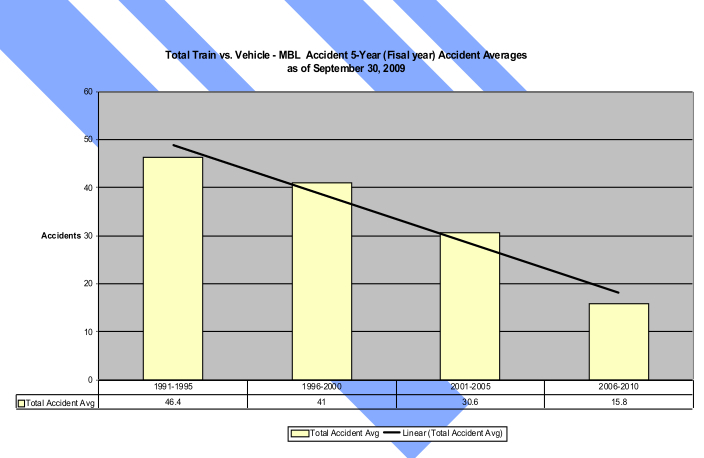 Metro data shows the number of train-vehicle accidents has steadily declined. Click to see a larger image. •Metro photo enforcement cameras along the Blue Line route detected 120,289 violations from Sept. 1995 through 2009, resulting in 49,845 citations issued to motorists for illegally crossing train tracks against warning signs and signals such as red flashing lights, bells, gates and train horns. (Tickets were only issued in violations with the clearest photographic evidence). Click here for a spreadsheet. •Among the safety improvements Metro has made to the Blue Line since it opened are installing four-quadrant crossing gates at six intersections, reducing the height of fencing along the tracks so that train operators have a better view of cross-traffic, installing a “cyclops” light on trains to improve their visibility and adding pedestrian gates at several crossings. L.E.D. “TRAIN” signs have also been installed to deter motorists from making illegal left turns in front of the train and running red lights. Click here for a document with a full list. And here is a link to a 38-page power point presentation assembled by Metro staff on Blue Line safety improvements. •How do Metro’s light rail safety statistics compare to light rail systems operated by other agencies over the past decade? Metro tends to have more total fatalities but its incident rate and fatality rate is on par with other agencies, according to data provided by the Federal Transit Administration. It should be noted that Metro offers considerably more “passenger miles” of light rail service than other agencies and that all of Metro’s fatalities have been on the Blue Line. The Green Line — which is completely grade-separated — and the Gold Line have not had any fatalities due to accidents, according to Metro officials. •Despite all this, pedestrian deaths and suicides on the Blue Line have not declined in the past decade — there were 33 from 1990 through 1999 and 39 from 2000 through 2009. That is the reason that overall fatalities from the Blue Line have not decreased, as the chart below illustrates. A comparison of fatalities by year on the Blue Line. Warning lights embedded in the roadway will soon be tested along the Blue Line. Vijay Khawani, director of corporate safety for Metro, believes the line is safe and has a complement of safety features that exceed federal and state standards. “I think there are two sides of the equation,” he said. “You have the agency responsible for building and operating the light rail lines and that has an obligation to incorporate safety measures and you have the public that has to obey the warning signs that we install. People have a responsibility to obey both the active and passive warning devices. Metro officials say that the Blue Line has more than met the safety requirements of the California Public Utilities Commission, which oversees rail safety in the state. 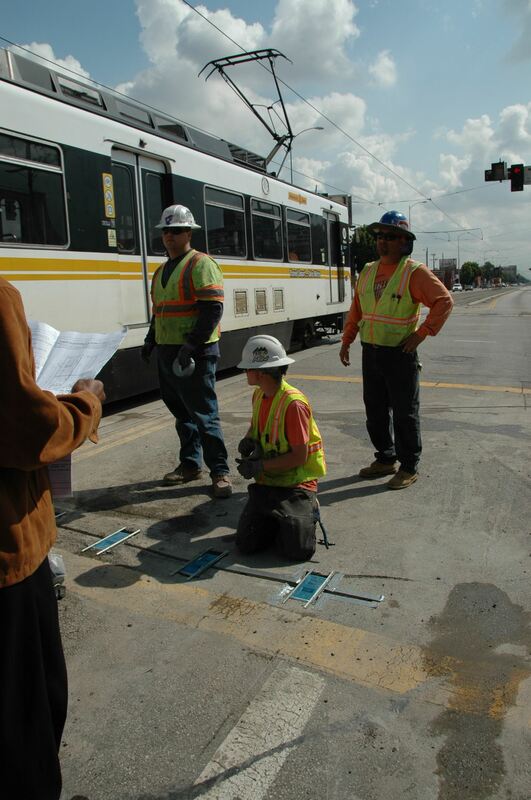 Although it includes many of the safety features built into the Pasadena and Eastside Gold Lines — which opened in 2003 and 2009, respectively — the Blue Line does not yet have every safety feature put on the Gold Line. Khawani said that the Blue Line has been and will continue to be retrofitted with additional safety features. 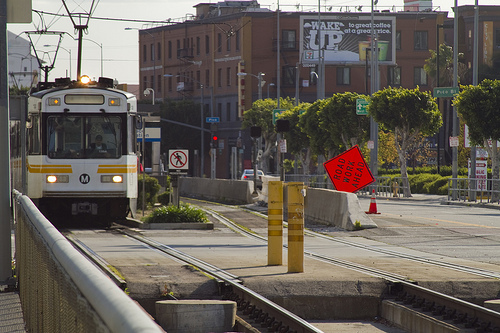 In early March, for example, Metro installed warning lights that are embedded in the road at Washington Boulevard and Los Angeles Street in downtown Los Angeles to warn motorists not to make illegal left turns in front of the train (see photo, at right). The effectiveness of the lights is being tested as part of a test program being run jointly with the city of Los Angeles. Metro is also studying whether there is space on sidewalks to accommodate pedestrian swing gates at 27 more locations. Pedestrians must open the gates before walking across the tracks — the idea is the gates give people pause and remind them they’re entering an area where they need to be alert. Installing the gates isn’t always easy — there has to be enough space on sidewalks to accommodate them. In tomorrow’s post, we’ll take a look at efforts to enforce safety laws around the Blue Line. If you would like to provide feedback on this post, please write us at thesource@metro.net.